When producing marketing and advertising materials for UW–Madison, it’s important to represent the brand in a spirited, yet professional, manner. Conveying a brand goes beyond what we say—it’s also how we say it. UW–Madison’s tonal words—Passionate, Approachable, Unconventional, Catalytic, Purposeful, Tenacious, and Grounded—serve as a launching pad for the voice and tone of the UW–Madison brand. Think of these words not in terms of a checklist, but of a spectrum you can reference and adjust. Depending on the nature and audience of the piece, there is flexibility to emphasize some tonal elements over others. For example, when writing for undergraduates or prospective students, the tone and style should be at its most aspirational (Passionate) while maintaining an air of achievability and realism (Approachable, Grounded). When writing for internal or alumni audiences, the tone and style should work toward one unified message (Purposeful), contain an engaging subject (Passionate, Tenacious), and remind the reader what sets UW–Madison apart (Unconventional). You may also reference the Brand Positioning Statement, Brand Pillars, and Brand Rationale as you aim to write with UW–Madison’s voice and tone. The goal of the UW–Madison Editorial Style Guide is to provide a reference for points of style specific to UW–Madison and the Wisconsin Foundation and Alumni Association: to detail items that university communicators use frequently, and to ensure that UW–Madison titles, locations, departments, and the like are used in a consistent manner. Read more in the UW–Madison Editorial Style Guide. Be consistent and professional. Follow AP or Chicago style guidelines for general rules, as well as the UW–Madison Editorial Style Guide for points of style specific to the university. Make sure your writing is accessible to a wide, external audience; avoid internal jargon, acronyms, and overly technical terminology. Remember that your audience may have diverse backgrounds and interests and varying familiarity with your topics or units. Always think about your audience as you write. What do they need to know? Why should they care? Your audience should guide your every word. Tirelessly fact-check and avoid hyperbole. If you can’t confirm a statistic or back up a talking point, write around it. Accuracy and authenticity are essential. Write clearly and concisely and avoid fluff. Read each sentence individually. If it doesn’t convey a core message when it stands alone, consider omitting it. Use the active voice. Strong, active verbs enhance the weight and clarity of your sentences. Avoid using gerunds (adding an “–ing” to a verb so it functions as a noun), especially in headline copy. Not only do they often make for lazy headlines, but the meaning can be easily misinterpreted. Craft engaging headlines, but make sure they’re also representative of the subsequent body text. An effective headline immediately breaks through the clutter and compels the audience to read further. Provide proper context. We know that Terrace chairs are iconic, “Jump Around” is a timeless tradition, and Bascom Hill is a tiring trek, but someone who has never visited campus may not know what those things are or why he or she should care. Words and visuals should complement each other to provide necessary context and evoke positive feelings. As with any brand, differentiation is the key. 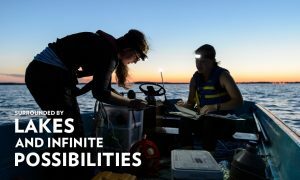 Highlight aspects of UW–Madison that make us different. Consider calling upon academic rankings, enrollment numbers, renowned research findings, notable alumni, popular campus destinations, and similar points of pride. Here’s just a start: Vitamin A. Vitamin B. Embryonic stem cells. Lake Mendota. Wisconsin Idea. Sifting and Winnowing. Pink flamingos. Lady of the Lake. Abe. Bascom Hill. State Street. The Capitol. Camp Randall. Spellcheck. Proofread. Repeat. Remember, your materials represent the entire university and a world-class academic institution.